Dream Wedding dress and super comfortable, I was the most beautifull and happy bride the day of my wedding. You can have two dresses in one: The Bolero sleeves are detachable as shown in the picture. Is Backed zip clousure, v-neck, Ballgown skirt with train that can be bustled. 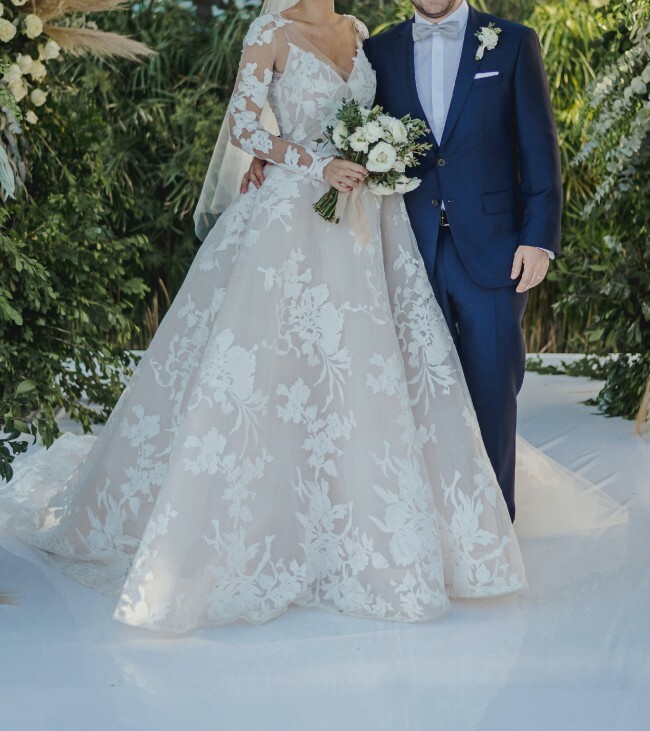 I bought the dress in Chic Parisien in Miami, in February, and my wedding was on March. It includes the Bolero Moaeve, that matches the dress. Also the vail that is also Monique Lhulier. Label size: 6 Bust: 34" Waist: 25.5" Hips: 41" Height: 5' 7"
The only alteration I made was directly made with Monique Lhullier, I raised 1" the neck line, it was to low cut for me. Size 6 fited perfectly in my waist. Also the lenght was modified. Once you send a message, Daniella can invite you to purchase the dress.